….to me where I put the 507A and 507B …. Are you still working on the basis that 507A & 507B were two different colours? The bridge looks fairly consistent in pretty much all of the B&W photographs of PoW on her way to or arriving in Singapore, but I am struggling to reconcile those with the colour clip from Gibraltar. Am I seeing a Tone A swoop on the side of the bridge on the colour clip, or is it just shadow from under the signal deck? I'm now thinking it's just a shadow and that it didn't change. I am wondering if a combination of B6 and MS3 might comprise the bridge; a look similar to that on the famous IWM colour Seafire photographs showing Indomitable's island behind. I am still looking at them as two different colours with 507B as a 50/50 mix just to be safe. I am still open minded about what it can be and have converted the new colour chart published by Sovereign to Black and White in Adobe Photoshop and added a few patches for comparison. I know it will never be 100% perfect and it may even be way out. Edit - MS3 photo added - bridge note blotch below it. I am not sure if I am onto something here but again with that "periodic table of colours" I have again converted it to Black and White in Adobe Photoshop and taken patches of what was recorded to be the "unchallenged" colours HMS Belfast was supposed to be painted in. I cross referenced them with the correct year on the chart. I put B6 in as B30 and 507C in as well as B5. I made the mistake of labelling 507A as G5 when I misread the wrong column. I can see your logic, but to avoid muddying the waters it may be safer to use "50/50" nomenclature on the swatches currently labelled 507B to clarify what is meant. Having said that, the 50/50 mix of 507A and 507C described in CAFO 1112/42 is quite clear in its intentions that medium tone mixed grey is for use in emergency camouflage without pattern. To find it amidst a patterned scheme amongst all the other shore-supplied MS & possibly B paints would seem unusual. I don't think arguments that 507B literally was a 50/50 mix of anything really holds any credibility now. For that to be true, the Admiralty would have needed to be at odds with the sea-going fleet at large because the Admiralty have left a substantial paper trail in the archives of 507B being as we described in the recent paper - i.e. just an inter-war formulation for Home Fleet Grey with enamel to make it harder wearing. The scheme may be correct by accident, but it is highly unlikely to be a combination of pre-April 1943 Pattern 507s and Standard Camouflage Colours plus post-April 1943 B&G series. 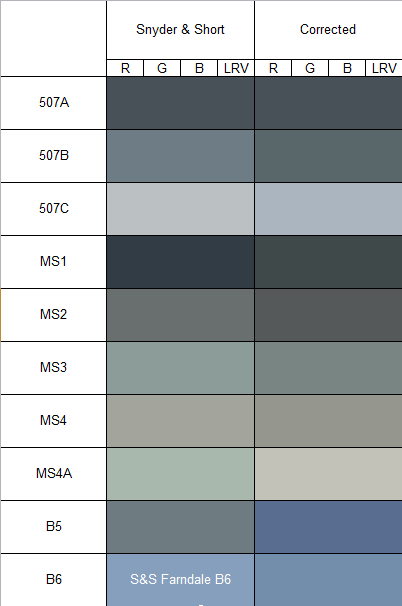 It will either be MS1, 507A, B5, B6 and 507C designations, or it will be G5, G10, B15, B30 and G45 designations - assuming the colours themselves are identified correctly which I haven't looked in to. Lindsay and I have been toying with relative tonal analysis offline and whilst it does work to a degree as you can see, it's hard to draw definitive conclusions from it. It may have been A.E. Schuil who has left behind archived records discussing in 1941/42 how hard it is to photograph relative tone faithfully. Infact he went as far as to list the necessary conditions to be satisfied in order to be able to use photographs for assessment of relative tone and we agreed that in practise those conditions could not be met. It does still provide an indication though. What you have done is demonstrate why I have had to change most of the colours even if the Snyder & Short versions were close in characteristics. When converted to black and white their relative tones are all wrong as compared to documented numerical values in the archives. The Snyder & Short ones will never properly reconcile with reality in tone, and hence, all interpretations of colour schemes based on the Alan Raven / Snyder & Short colours are suspect. One cannot correctly state "this looks like X, Y and Z" if one's understanding of X, Y and Z is incorrect. That area is typically black in appearance on virtually every shot (even pre-camo) but I think this shot shows it's not shaded but simply local color. Also, the top of the armor belt appears much darker in some images, but not all. Many photographs even suggest that B was painted on top of the armor belt where you'd expect A, but some shots show a very dark line even in regions of B. The image is very strange indeed particularly with a very parallel black line so close to the guard rail line. I am beginning to think that it is an error with the film and not a correct image - https://micro.magnet.fsu.edu/primer/pho ... rrors.html - I have not had time to read the entire article but I think the last photo you posted is probably most definitely some sort of damage on the film, processing error or printing error. Really? Incidentally only visible for a white funnel cap. Do you have the full size of all those images you can send me so that I can have a closer look. It seems to me that the dark line extends the entire length of the ship depending on how dark or light the paint is. The one above with Churchill waving is most unusual as it has patches of almost black that should not exist that are almost in a perfect straight line parallel to the railings. Except for one, those shots are pretty much 100% size. That is, zooming in shows little else. That is the top of the armor belt so that is perfectly fine. Perhaps they did paint to top of the belt with another colour as some counter-shading or perhaps it it caused somewhere down the line from film production towards reproduction, but suggesting it is picture damage that somehow perfectly captures the belt and not Churchill standing in front of it does not compute. Fact: the top of the belt appears very dark on that and several other photographs. The shots of HSM PoW arriving in Singapore do not show a MS1 top belt, but, you cannot make out any difference between regions of A & B on top of the belt as is the case on nearly all images. Perhaps the top-belt A regions are also B. The photos are very unusual and the dark lines where not there at the time of sinking or appear not to be there. It is certainly not appearing to be there on that Atlantic conference it did either. Is there any reason that the area could be wet or covered in water that spilt from the decks for some reason that darkened it at the time of the photo like for a wash-down. It is just very bizarre and does not make sense at all being that dark. I have again converted it to Black and White in Adobe Photoshop and taken patches of what was recorded to be the "unchallenged" colours HMS Belfast was supposed to be painted in. Does photoshop create grayscale the same way WWII film did? There are many plugins that simulate all kinds of films (e.g, http://www.psdfilm.com/black-white-film ... oshop.html) so if you know the spectral response of ww2 films it should be possible. Last edited by SovereignHobbies on Wed Oct 31, 2018 12:27 pm, edited 2 times in total.